Background: Human Immuno deficiency Virus (HIV) infection has attained pandemic level due to its complexity on both the HIV infection cycle and on the targets for drug delivery. This limits medication and consequently requires prominent and promising drug delivery systems to be invented. Notably, various nanomaterial have been studied to enhance effective delivery of the antiretroviral drugs for HIV prevention, diagnosis and cure. Some of these nanomaterials are liposomes, dendrimers, inorganic nanoparticles (NPs), polymeric micelles, natural and synthetic polymers. Objective: The present study aimed to review the recent progress in nanomedicine as a newly emerging approach to combat HIV. Method: The scientific data bases reviewed carefully to find both in vitro and in vivo studies representing the role of nonomedicine to combat HIV. Result: Impressively, nanomedicine drug delivery systems have been commendable in various models ranging from in vitro to in vivo. It gives notion about the application of nano-carrier systems for the delivery of anti-retroviral drugs which ideally should provide better distribution to surpass Blood- Brain Barrier (BBB) and other tissue or to overcome innate barriers such as mucus. Considerably, nanomaterials such as dendrimers and many other inorganic NPs such as silver, gold, iron, and zinc can be used for HIV treatment by interfering in varying stages of HIV life cycle. Furthermore, NPs could best act as adjuvants, convoys during vaccine delivery, as intra-vaginal microbicides and for the early detection of HIV-1 p24 antigen. 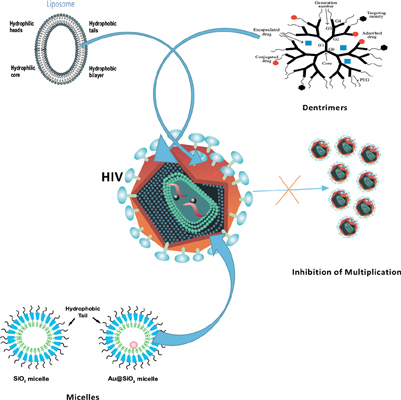 Conclusion: Nanomedicine may be a proper approach in HIV/AIDS therapy by means of offering lower dosage and side effect, better patient-to-patient consistency, bioavailability, target specificity and improved sensitivity of HIV diagnosis. Antiretroviral drugs, drug delivery, HIV, nano-carriers, nanomaterials, nanomedicine.